Wash seaweed and soak in cold water in a large bowl for approx. 8 – 10 min. Drain and set aside. Julienne carrot and cucumber. Cut onions into fine rings. Cut green onions crosswise into thin slices. Finely chop chili and cilantro. 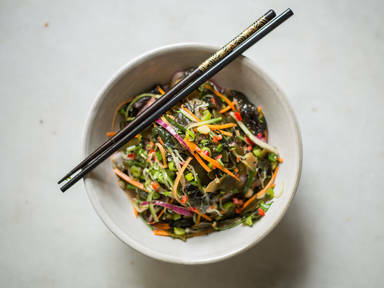 Combine seaweed, carrot, cucumber, onion, chili, green onion, and cilantro in a large bowl. Grate ginger into bowl. Add sesame oil, sesame seeds, sweet chili sauce, and lime juice. Season to taste with salt and pepper. Toss salad thoroughly. Enjoy!